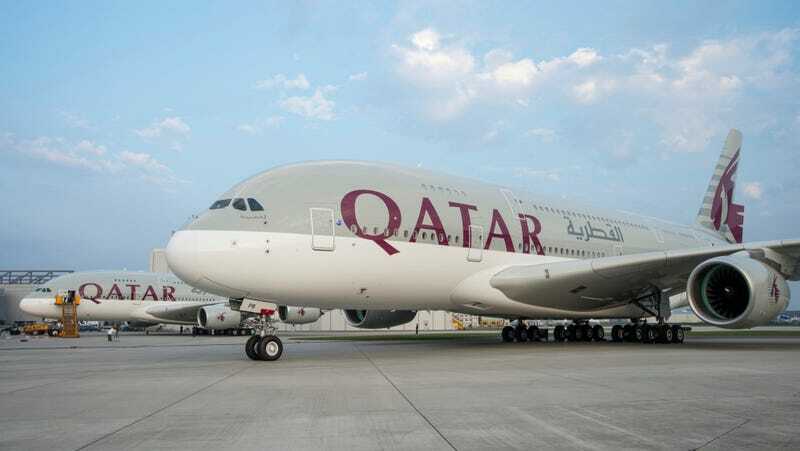 Qatar Airways is one of the world's most luxurious airlines, and is the most recent airline to receive the world's largest passenger jet, the Airbus A380 into its fleet. Airbus has compiled a video series of the plane's production for our amusement, so let's check it out. During the production phase, we see the three fuselage sections of MSN 137 (the 137th A380 built), tail and wings arrive on trailers, to the assembly site in Toulouse. They're moved from the fabrication site at Langon, which is 220km away, in the middle of the night. In the two-night process, they spend about five hours on the road the first night, and seven hours the second night. In fact, Airbus just completed its latest convoy early this morning. Here's a timetable of the most recent convoy (in French). In Toulouse, all six major parts are joined together, using something called a tool jig, which is a huge scaffolding is assembled around the fuselage. Next, the plane is rolled out of the assembly hall and the Engine Alliance GP7200 engines are attached. The Rolls-Royce Trent 900 is another engine option for the A380. The plane is put through all of the necessary final assembly, and general testing is completed. These tests include electric and hydraulic systems, onboard computer, mobile parts, and landing gear. Fuel tanks are also tested for leaks at this point. Next, it is test-flown, and then it's flown to the paint shop in Hamburg, Germany. In Hamburg, the entire plane is masked off then spray-painted, by hand, by humans. Just watch the video, because that's the only way you'll ever appreciate the painstaking work that goes into painting this massive jet. Airbus says the A380 painting process takes a crew of about 30 people 10 days. Nine of those days are just for prep work. Cabin furnishing also takes place in Hamburg, then the plane is either taxied to the delivery center in Hamburg for European and Middle East customers, or flown back to Toulouse for delivery to African, Asian and Americas customers. I wrote about the details of the Qatar A380 First Class cabin back in March, and again in July when Qatar rejected its first A380s because the finishings weren't up to the CEO's liking. The plane seats 517 people — 461 in economy, 48 in business class, and eight in First Class. The production of a commercial aircraft is absolutely fascinating, and hard to really fathom if you've never seen it in person. I've toured Boeing's widebody factory and 737 factory in the Seattle area, but I've never been to Airbus or the other commercial builders. Hopefully, I'll get to check those off my list one day, to share with you.